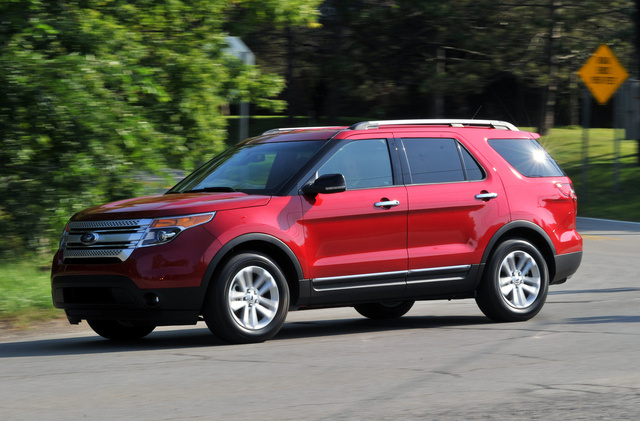 The once big and bold Ford Explorer is now a shadow of its former self, but the 2012 version of the Explorer Base nevertheless offers a practical and economical midsize crossover. Traditionally well-equipped, this hefty family-oriented ute sports unibody construction, a surprisingly posh, if not particularly spacious cabin that boasts simulated alloy accents, 3 rows of standard seating for up to 7 occupants and, with the rear seats folded, 80.7 cubic feet of useable cargo area. The entry-level edition also comes with 17-inch steel wheels, a roof rack and rear spoiler, cloth upholstery and front bucket seats. A power-adjustable driver’s seat, reclining second-row seating and floor mats in all 3 rows, as well as full power accessories and the useful MyFord trip computer, grace the Explorer Base, along with cruise control and telescoping tilt-wheel steering. Finally, this basic crossover is delivered with a 6-speaker audio system boasting an MP3-capable single-CD player. Notable options for the Explorer Base trim include a Class III towing package, as well as Ford’s popular SYNC voice-activated audio and communications system, satellite radio and roof-rack crossbars. A 3.5-liter variable-valve-timed (VVT) Flex Fuel (FFV) V6 engine powers the 2012 Explorer Base, under the tutelage of the standard 6-speed shiftable automatic transmission. Expect 290 hp and 255 lb-ft from this combo, with towing capacity maxed out at 5,000 pounds when properly equipped. Mileage, meantime, is estimated at 17 mpg city/24 highway for this front-wheel-drive-only (FWD) crossover. Ford has additionally made a 240-hp 2.4-liter turbocharged inline 4-cylinder (I4) EcoBoost powerplant available to the base Explorer for 2012. Matched with the uniquely geared 6-speed shiftable automatic transmission, the four-banger puts out 270 lb-ft of torque, can tow up to 2,000 pounds with the available Class III tow package and is estimated to get mileage of 20/28. Traditionally a family-oriented ute, the Explorer Base offers standard 4-wheel antilock brakes (ABS), traction and stability control, 3-row head airbags and front side-mounted airbags with head protection chambers. A post-collision safety system also comes standard. Add a unique 4-wheel drivetrain to the 2012 Ford Explorer and behold the Explorer Base 4WD. This previously truck-based SUV has been endowed with unibody construction to complement 3 rows of seating for 7 and now presents itself as a midsize crossover ute. Look for 80.7 cubic feet of cargo area with the rear seats folded, while exterior adornments include 17-inch steel wheels, a roof rack, rear spoiler and power-adjustable mirrors. Peek inside the unfortunately less-than-oversized cabin to find cloth upholstery, a power-adjustable driver’s seat, front bucket seats and reclining second-row seating, all complemented by simulated alloy cabin trim accents. Cruise control and telescoping tilt-wheel steering are also standard, as are front and rear air conditioning, remote power door locks, power windows and floor mats in all 3 rows. Finally, entertainment consists of MP3-capable single-CD player and 6 speakers. Options include Ford’s SYNC voice-activated audio functions, a Class III towing package, satellite radio and roof-rack crossbars. Powering the 2012 Explorer Base 4WD is a flex-fuel (FFV) 3.5-liter V6 engine that puts out 290 hp. A standard 6-speed shiftable automatic transmission (with descent control) allows 255 lb-ft of torque, and variable valve timing (VVT) means estimated mileage of 17 mpg city/23 highway. With the available towing package, the Base 4WD can haul up to 5,000 pounds, while Ford’s touted Terrain Management System allows drivers to dial in a particular 4WD setting to match surface conditions, allowing this overgrown crossover better-than-average off-road prowess. Finally, the more noteworthy safety features delivered with Ford’s latest crossover include 4-wheel antilock brakes, traction and stability control, 3-row head airbags and front side-mounted airbags with head protection chambers. Additionally, look for a standard post-collision safety system. As the midlevel trim of Ford’s 2012 Explorer crossover lineup, the XLT adds a few extra amenities to an already well-wrought frame. To begin at the beginning, this now-cute ute features 80.7 cubic feet of total cargo room, 3 rows of seating for 7 and an available Class III towing package, for up to 2,000 pounds of towing capacity with the optional EcoBoost 4-cylinder powerplant or 5,000 pounds with the standard V6. Standard amenities include 18-inch alloy wheels, a roof rack and a rear spoiler, heated power-adjustable outside mirrors, power-adjustable front seats, premium cloth upholstery, simulated alloy and leather cabin trim, digital keypad power door locks and, of course, power windows. Cruise control and telescoping tilt-wheel steering also come standard, as do rear parking sensors, front and rear air conditioning and floor mats in all 3 rows. Entertainment, meantime, consists of an MP3-capable single-CD player with 6 speakers, satellite radio and a USB connection. Finally, subscriber voice directions and Bluetooth hands-free communications add a touch more to the convenience factor. The 2012 Explorer XLT can be delivered with available roof rails, touchscreen GPS navigation and second-row captain’s chairs, as well as upgraded 20-inch wheels, rear-seat DVD entertainment, a power liftgate and a dual-panel power moonroof. Also available is the XLT Driver Connect Package, boasting SYNC/MyFord Touch voice-activated climate control, audio and communications, as well as heated front seats, dual-zone climate control and premium audio with 9 speakers. A standard 3.5-liter Flex Fuel (FFV) V6 powerplant gives this capable crossover its go, with the slick 6-speed shiftable automatic transmission managing 290 hp and 255 lb-ft of torque. Variable valve timing (VVT) allows an estimated 17 mpg city/24 highway in the front-wheel drive (FWD) XLT, while an available towing package lets owners tow up to 5,000 pounds. Available to the Explorer XLT for 2012 is an economical, if not exactly pavement pounding, 2.4-liter turbocharged EcoBoost inline 4-cylinder powerplant. Under the management of the tweaked 6-speed shiftable automatic transmission, expect 240 hp and 270 lb-ft of torque from the four-banger, along with 2,000 pounds of towing capacity when properly equipped, and mileage estimated at 20/28. Meantime, the I4-equipped XLT now sports standard low-rolling-resistance tires. Standard safety features in the midlevel Explorer XLT include 4-wheel antilock brakes (ABS), traction and stability control, 3-row head airbags and front side-mounted airbags with head protection chambers. Finally, all Explorer XLTs come with a standard post-collision safety system, front fog/driving lights, turn-signal-integrated mirrors and a remote antitheft alarm, with Ford’s touted BLIS blind-spot warning system and inflatable rear seatbelts optional. Adding terrain-taming 4-wheel-drive (4WD) capabilities to the already well-endowed 2012 Ford Explorer XLT begets owners the midlevel Explorer XLT 4WD. This midsize crossover additionally sports 80.7 cubic feet of cargo area as well as the standard 3 rows of seating for up to 7 occupants. Standard exterior adornments include 18-inch alloy wheels, a roof rack and a rear spoiler, not to mention heated power-adjustable mirrors. Inside, look for premium cloth upholstery, power-adjustable front seats, leather and simulated alloy cabin accents, digital keypad power door locks and power windows. Cruise control and telescoping tilt-wheel steering are, of course, included, as are rear parking sensors, and all of this is complemented by front and rear air conditioning. Finally, an MP3-capable single-CD player with 6 speakers also comes standard, along with satellite radio, a USB connection, Bluetooth hands-free communications and subscriber voice-directions navigation. Options-wise, the 2012 Explorer XLT 4WD is eligible for the popular Driver Connect Package with SYNC/MyFord Touch voice activation and touchscreen navigation, audio, dual-zone climate control and communications, as well as leather upholstery, heated front seats and premium 9-speaker audio. Various standalone options, meanwhile, include upgraded 20-inch wheels, the voice-activated navigation suite, second-row captain’s chairs, rear-seat DVD entertainment and a dual-panel power moonroof. Standard power in the latest Explorer XLT 4WD is a 3.5-liter Flex Fuel (FFV) V6 engine that mates with a 6-speed shiftable automatic transmission, with standard descent control, for 290 hp and 255 lb-ft of torque. Properly equipped with the available towing package, the XLT 4WD will haul up to 5,000 pounds of trailer, while mileage remains at 17 mpg city/23 highway. The standard 4WD system, finally, includes a driver-selectable Terrain Management System that matches drivetrain to terrain for commendable light-duty off-road performance. The traditional safety features inhabit Ford’s capable 4WD crossover and include 4-wheel antilock brakes (ABS), as well as the ubiquitous traction and stability control. Front side-mounted airbags with head protection chambers and 3-row head airbags, along with a post-collision safety system, turn-signal-integrated mirrors, a remote antitheft alarm and front fog/driving lights are all standard safety equipment, as well. For additional safety, Ford’s BLIS blind-spot warning system and rear-seat inflatable seatbelts are notable occupant-protection options. As the flagship trim of the 2012 Ford Explorer lineup, the Explorer Limited totes a passle of bling that fits its elevated status. Of course, this top-shelf crossover still boasts 3 rows of seating for up to 7 passengers, and cargo area remains a respectable 80.7 cubic feet, but such details only scratch the surface of what this princely people-hauler offers. Start with standard 20-inch alloy wheels, a roof rack, rear spoiler and heated power-adjustable mirrors outside, and then add leather upholstery, heated power-adjustable front seats and power-adjustable pedals inside. Now, throw in cruise control, telescoping tilt-wheel steering, keyless entry and ignition, power windows and tri-zone climate control. Add to that a rear-view camera, rear parking sensors, a universal remote garage door opener and memory for driver's settings, and you begin to appreciate this midsize crossover’s attributes. But that’s not all; this elegant ute also tosses in added simulated alloy and leather cabin accents, as well as Bluetooth technology with real-time traffic and a 390-watt Sony premium audio system that sports an MP3-capable single-CD player, 12 speakers, 5.1 Surround Sound, satellite radio, a USB port and a memory card slot. Options, of course, are also on a higher plane and include a number of Rapid Spec packages that add the SYNC/MyFord Touch voice-activated and touchscreen audio, navigation, climate control and communications systems, as well as a power-folding third-row seat, upgraded leather upholstery and heated and cooled front seats. Remote engine start, Adaptive Cruise Control and, for those frustrated with finding a vacancy in the typical over-worked parking lot, Active Parking Assist, also come with various Rapid Spec bundles, while rear-seat DVD entertainment, second-row captain’s chairs and a dual-panel power sunroof are all available as standalone options. Powering the 2012 Explorer Limited is a variable-valve-timed (VVT) 3.5-liter Flex Fuel (FFV) V6 engine that combines with the standard 6-speed shiftable automatic transmission for 290 hp and 255 lb-ft of torque. These ponies are good to tow up to 5,000 pounds of trailer with the available Class III towing package added, and mileage in this front-wheel-drive (FWD) crossover is estimated at 17 mpg city/24 highway. New for this year, Ford’s self-proclaimed leader in crossover-class fuel efficiency, the 2.4-liter EcoBoost turbocharged inline 4-cylinder powerplant, provides an optional engine choice for the Explorer Limited. Mated with the appropriately geared 6-speed shiftable automatic, the four-banger throws out 240 hp and 270 lb-ft of torque, and mileage estimates run a respectable 20/28. With the available towing package, look for a max trailering capacity of 2,000 pounds. Safety-wise, the 2012 Limited boasts standard 4-wheel antilock brakes, traction and stability control, front side-mounted airbags with head protection chambers and 3-row head airbags. This high-end trim also boasts front fog/driving lights, turn-signal-integrated mirrors, a post-collision safety system and a remote antitheft alarm as standard equipment, with Ford’s BLIS blind-spot warning system and inflatable second-row seatbelts each optional. Standing proudly at the summit of the 2012 Ford Explorer lineup, the Explorer Limited 4WD comes with nearly all the techno bells and whistles one expects from Ford, along with standard 4-wheel drive (4WD). Naturally, this midsize crossover boasts the 3 rows of seating for 7 and 80.4 cubic feet of total cargo area of its lesser siblings, while also flaunting standard 20-inch alloy wheels, a roof rack and a rear spoiler, as well as heated power-adjustable outside mirrors. A pleasant, if somewhat undersized cabin, meantime, boasts leather upholstery, heated power-adjustable front seats, tasteful simulated alloy and leather interior trim accents, keyless entry and ignition, memory for driver's settings and power-adjustable pedals. Of course, cruise control and telescoping tilt-wheel steering are standard, as are rear parking sensors and tri-zone climate control, while techno-gizmos include Bluetooth hands-free communications, a universal remote garage door opener, subscriber voice-directions navigation that’s free for 3 years and a rear-view camera. Finally, Ford’s high-end midsize crossover throws in a standard 390-watt stereo with single-CD player, 12 speakers, 5.1 Surround Sound, satellite radio, a USB port and a memory card slot. The potent 3.5-liter Flex Fuel (FFV) V6 engine again graces this top-shelf trim, with a capable 6-speed shiftable automatic transmission boasting standard descent control and managing 290 hp and 255 lb-ft of torque. Expect 5,000 pounds of towing capacity from this peppy drivetrain, while mileage is estimated at 17 mpg city/23 highway. Additionally, the 2012 Limited 4WD sports Ford’s slick Terrain Management System that features driver-selectable modes determining torque and transmission settings best suited to snowy roads or light off-road conditions. Standard safety features aboard Ford’s award-winning Limited 4WD crossover include 4-wheel antilock brakes, traction and stability control, front side-mounted head airbags with head protection chambers, and 3-row head airbags. Like its XLT sibling, this top-shelf trim sports standard turn-signal-integrated mirrors, front fog/driving lights, a post-collision safety system and a remote antitheft alarm, with Ford’s BLIS blind-spot warning system and inflatable second-row seatbelts both available as optional safety equipment.